2nd Night: Pray that you or someone you know should find a spouse, or (if you are married) for marital harmony. 4th Night: This is the night of the 4 Matriarchs, pray to be a normal woman, in the 4 walls of your home, with an essence of truth. 5th Night: This is the night of the 5 books of the Torah. Pray that your husband and children should be Torah scholars. On this night, for the first time the majority of the menorah is lit up. That means you can also pray for more light in your life, for a revelation. 6th Night: Pray for joy! 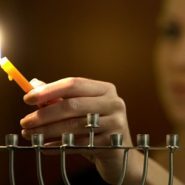 7th Night: Pray for joyful Shabbats: Shabbat is the source of all blessing. 8th Night: Pray to have a baby, or for a barren women. 8 is above nature, a very powerful day to pray. Thanks to Sarah Levine from KavanahKards for sending this my way. I love this, and love everything you send. Could Sara Levine tell me where she got this from. I enjoyed it and sent if off to friends and relatives, and one of the husbands wants to know the source and where it is found. Keep up your fabulous work!! Hi, I was the one who sent this to Sara Levine to start with.I was told that this is from the Kedushas Levi by the person who arranged the shiur. Thank you Chana Jenny as always…It is so inspiring!